Before we dig into some “traditional” ways to make pizza on a campfire, I wanted to share some cool alternative pizza recipes I found. 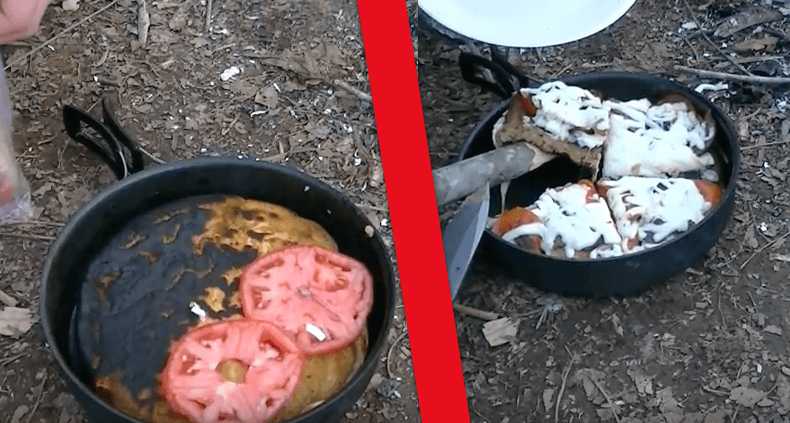 These are ways to make pizza-themed food on the campfire. As you'll see, they get pretty creative. Need some help thinking of ingredients? Not all ingredients will do well on a camping trip, but you can check out our list of pizza recipes for some ideas. Oh, and if you don't plan on roughing it this season, there are plenty of portable pizza grills that you can take with you that'll work with a 1 pound propane gas tank and will make high quality pizza at your campsite. There's also a ton of ways to convert your charcoal grill into a pizza oven, so if you're taking along your Weber grill to the campsite, you're in luck! There are no shortage of methods of cooking a regular flat-style pizza as well. Here are some of my favorites that I found. Do you have a special method? Let us know in the comments! This one is most like traditional pizza making, but it does require you have a grill apparatus. Check to see if your campsite has a grill there, or maybe you'll be trekking in with some equipment. Just make sure there's enough grill space for everyone! The #1 tip I hear from people doing it with this method is to grill one side of the dough, then flip, then add your toppings to the pre-grilled dough. You can even grill both sides if you are making extra thick dough. This is another popular method because it's so easy. Well, all campfire pizza recipes are kind of easy, but this one is nice because you can set it next to the fire or set some hot coals on top, then forget about it for a 10-15 minutes. It makes a nice round pizza, and if you make the dough right, it'll be thick and chewy like a lot of people enjoy their pizza. You can also make the dough super thick if you want and get a “pie” effect by adding dough around the sides. Add any toppings you want, and even cover with a layer of dough to make a calzone-pizza crossover. Having a lid on top traps in heat, much like how the KettlePizza can transform your charcoal grill into a pizza oven for the backyard. We also have a full list of 10 dutch oven pizza recipes we looked up, so you don't have to spend the time looking! Another common method that's similar to the dutch oven, but is going to weight less in a pack, and take up less space int he car. 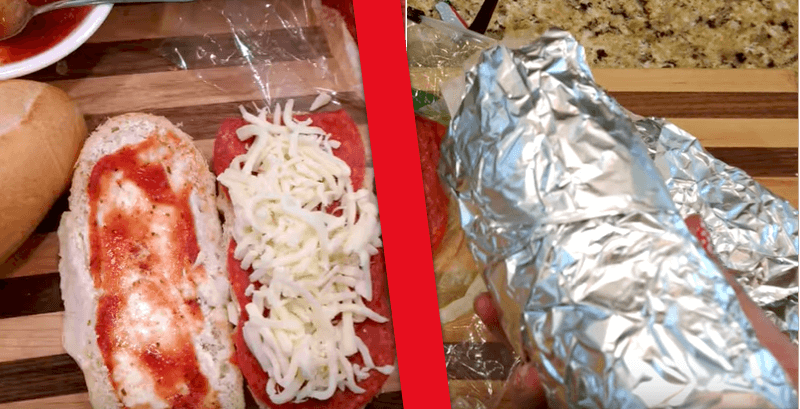 It's easy to wrap your pan in foil to trap in heat, though you don't hav the option to put coals on top because they may burn a hole in your foil, or at least stick cheese to the foil with their weight! Caution! I see a lot of folks burning their pizza dough in these recipes, so I wouldn't put your pan on direct heat for too long. Maybe keep it there long enough to get things started, then either place on a raised platform or move to the side and turn occasionally. Why bring the extra weight when foil works just as well as cast iron in many situations. Wrap your dough and ingredients in foil, then place in a hot area that's not on blazing flames. With this pizza below resting on the coals, I'm surprised it wasn't burnt terribly! You can also push the coals into a circle then place your pizza in the middle to absorb enough heat to cook but not too much to burn. Notice – there are small sticks in the pizza to prevent the top foil from sticking to the cheese. This one will be perfect for kids! They are easy to make, and hard to do wrong. You could eat them raw if you wanted since the bread is already cooked. They basically just need to warm enough to melt the cheese, but if you want them toasty just get them closer to the fire or leave them there longer. This is a great backpacking pizza recipe because it requires very light, minimal equipment (no cast iron!). If you've ever used these lightweight camping stoves, then you know the non-stick is useless, so this pizza is built backwards. Otherwise, you'd never be able to scrape out the dough without tons of oil. Pepperoni first, then dough. Place your pot on the gas fire (or whatever fire you have for your stove), and cook until the dough is done. Flip it over , then top top with cheese. You can put it back in the stove to melt the cheese, and then you're ready to serve! One of the most basic examples here, this is real caveman style pizza (except for the iron skillet). Toss lots of oil into the pan, then your dough. Cook one side, then flip. Add ingredients, plus cheese. Cook until the cheese is melted. Cut and serve. It's basic, but it works. Serving with a stick is a nice touch LOL.